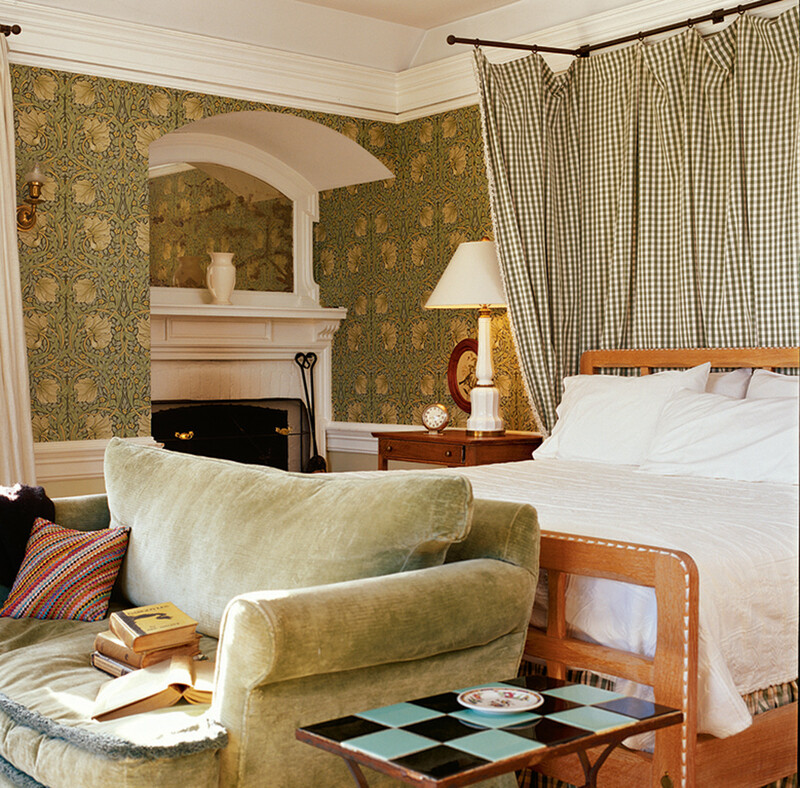 A custom-designed Cotswold bed and Morris’s “Pimpernel” wallpaper define a bedroom in the English Arts & Crafts mode. Say “Arts and Crafts” or “bungalow” and a very definite picture comes to mind: darkened oak, wainscot and plate rails, geometric pattern, and a dusky palette embracing amber, olive, and plum. We see the hearth, the wide frieze at the top of the wall, the slatted settles and tall dining chairs. Our vision may be cloudier, though, when it comes to bedrooms of the period. Bedrooms were, in general, lighter and simpler than rooms downstairs, often incorporating elements of the concurrent Colonial Revival. The Joinery’s “Sorenson Reverse Deluxe Bed” in cherry with quilted maple panels shown with Dunning nightstand and Grider dresser. Without a doubt, our choices today for furnishing a stylish bedroom are much greater than they were in 1905 or 1920. Sears, Roebuck sold a line of “mission” furniture, but only wealthy, individual clients were treated to designs by Greene and Greene or Frank Lloyd Wright. 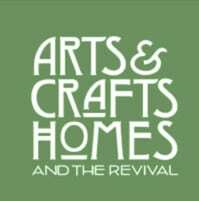 Now, the renaissance of Arts & Crafts philosophy and artisanry means that many different revivals are available to us: Stickley (including reproductions of Harvey Ellis’s inlaid designs), California, English Cotswold, Roycroft, Prairie School. Working in true Arts & Crafts tradition, today’s furniture makers offer new and interpreted designs, often with Scots–English or Asian leanings. The diversity of designs is apparent. Sawbridge Studio’s “Asian Gate” dresser in bird’s-eye maple and cherry. It’s instructive to look at original bedrooms of the Arts & Crafts period; some of them survive and others are documented in various books. Adopting the era’s sensibility will probably save you money, as bedrooms by the period’s tastemakers are startlingly monastic. 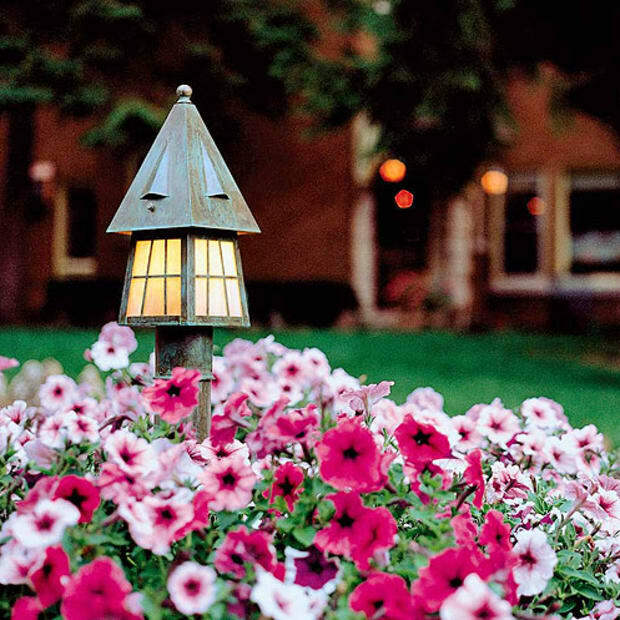 This is true even in Wright’s Prairie houses and Greene and Greene’s sprawling bungalows. At the Gamble House, beautifully detailed bedsteads are all the more sculptural against plain carpeting, neutral walls, and the simplest of lighting fixtures. Stickley’s The Craftsman magazine showed small bedrooms like monks’ cells, with monochrome walls and plain oak furniture. Upstairs rooms were historically trimmed out in softwoods. It was intended that this trim would be painted with an “enamel” of medium gloss. (Consider a very off-white hue in a beige, latte color.) Rugs and wallpaper or a paper frieze were optional. Stickley showed simple stenciling, and plain bordered carpets as well as Indian and ethnic scatter rugs. Other books and periodicals of the times show lighter, somewhat more feminine rooms with pastels and classical moldings. Then as now, textile and wallpaper patterns designed by William Morris work equally well as the backdrop in English art-movement, Colonial Revival, and Arts & Crafts rooms. 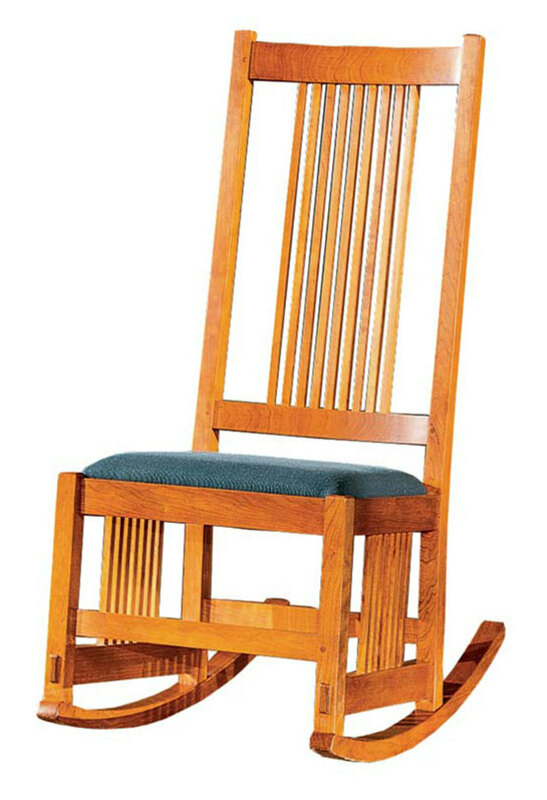 Stickley’s “Armless Spindle Rocker” is a bedroom space-saver with presence. 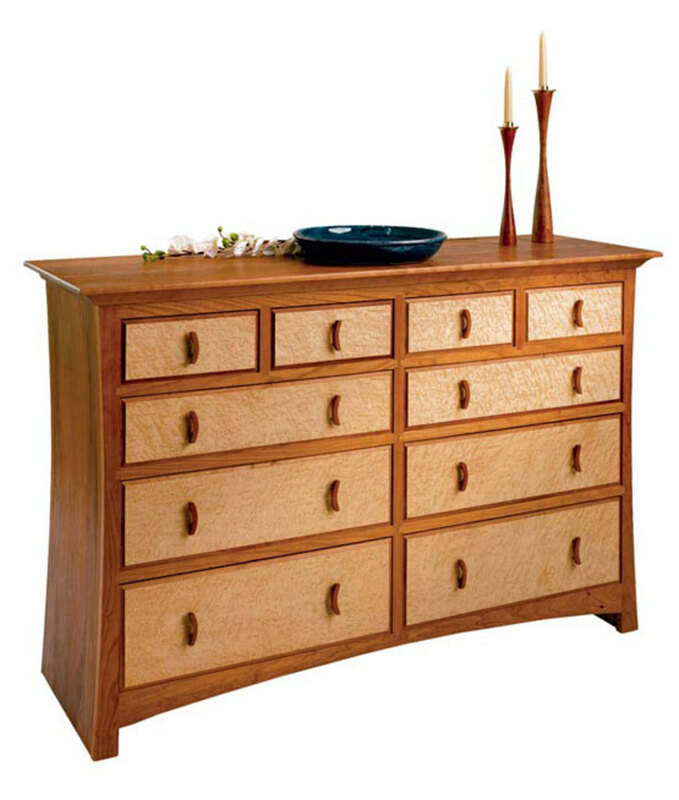 The rectilinear Stickley dresser is laid with a narrow scarf, perhaps plainly embroidered in one or two colors at the ends. A mirror above the dresser hangs by chains from the picture rail. The bed wears a plain bedspread, not white but not a dark color; it may have a border; it is tucked around the pillow and goes almost to the floor. No throw pillows, bolsters, or bedskirts are in evidence. A plein-air landscape painting hangs, again from short chains, over the head of the bed. The rug, covering most of the center of the room, has a plain, medium-tone ground with a border made up of one or more lines. An oak or wicker chair stands near the window. If there is a desk, it is small. If the room is large, an oak dressing screen softens one corner. At Stickley’s own family home in New Jersey, the girls’ bedroom (which has been restored to its 1911 appearance) is a little fancier, though still spare and architectural. It is anchored by a large, modern fireplace clad in blue Grueby tiles. The ceiling is finished in light-grey sand paint, the walls in silver-grey grasscloth. The floor is stained brown, as is the linear trim, but sashes are cream. 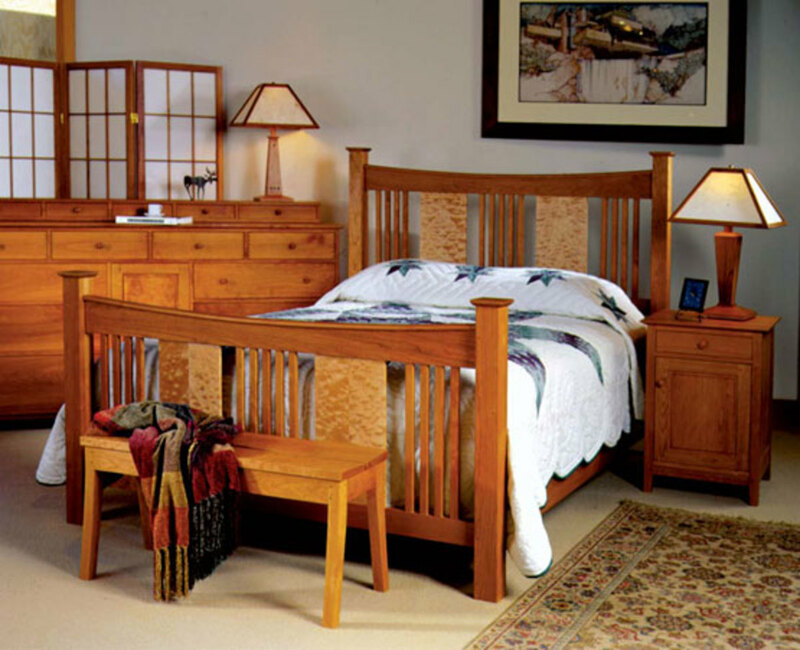 The furniture is from Stickley’s more decorative marquetry line, and there is an oriental carpet with light colors. In truth, Gustav Stickley didn’t sell all that much bedroom furniture. (A website antiques dealer recently posted, “Gus bedroom furniture is always hard to come by . 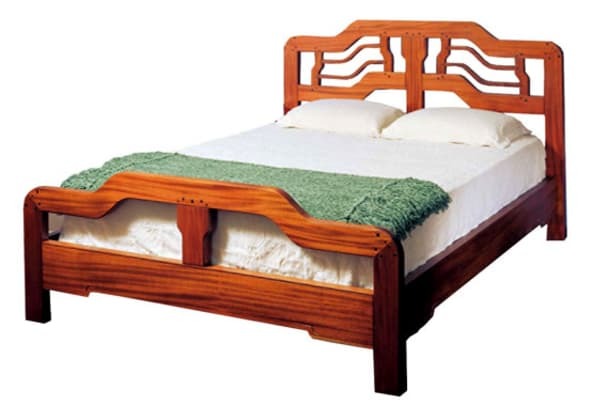 . . ” Many of the bedroom pieces available today came from L. and J.G. 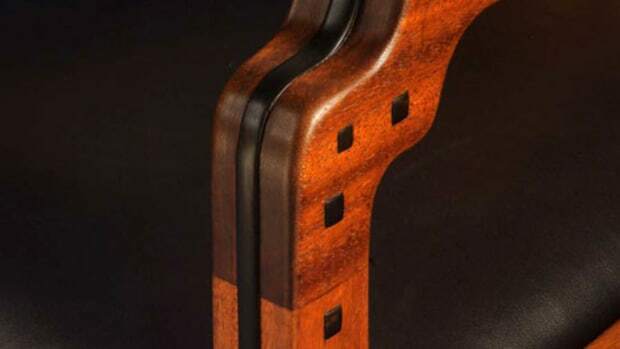 Stickley, whose company eventually absorbed Gustav’s.) Purchasers were more interested in outfitting their public rooms in the new style, so bedrooms invariably got the Renaissance Revival or populist “Eastlake” bed and dresser from Mother’s house. Ingrain carpeting, laid wall to wall in sewn-together strips, was still around. And many people just preferred Colonial Revival in the bedroom, especially in the years following the War. 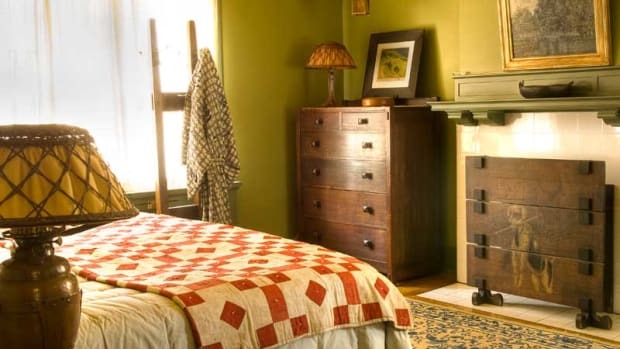 What is the right “dialect” for your Arts & Crafts bedroom? Region plays an important role, but so does taste. Does the house lean toward low-slung, modern geometry of the Midwest Prairie Style? This kind of furniture often works well in American Foursquare houses with strong horizontal emphasis. Do you gravitate toward the more sculptural California furniture, or a Spanish-influenced Southwestern look? 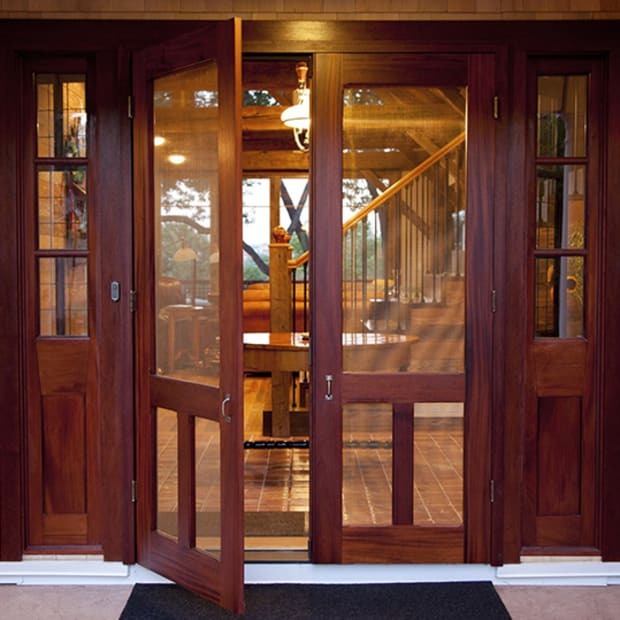 The most popular vocabulary, then and now, has to be the uncompromising lines of Stickley’s and Hubbard’s East Coast Arts & Crafts, the standard choice for those smitten with period bungalows. 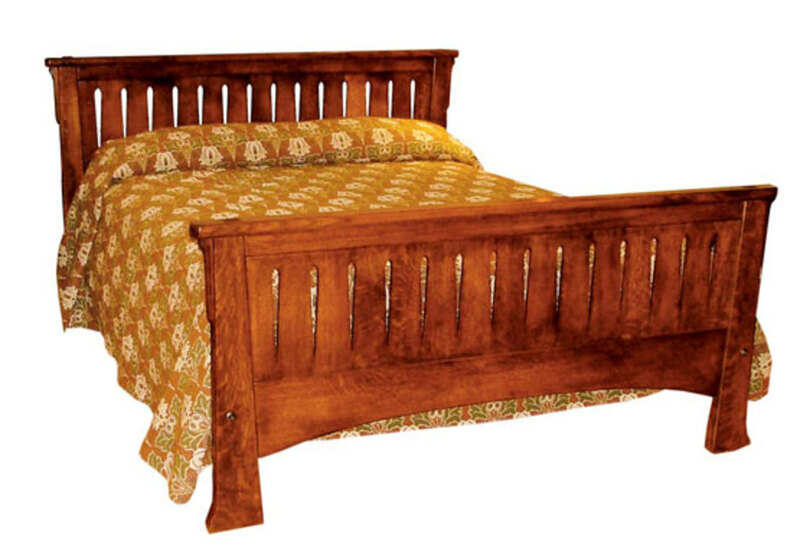 This is the Catlin bed, designed by Peter Maynard of Cold River Furniture. If you prefer a rather pure American Arts & Crafts look, keep three words in mind: architectural, monochromatic, and simple. (Gustav Stickley called for bedrooms to provide “a harmonious environment.”) Arts & Crafts was a strongly architectural style; as in living and dining rooms, angularity and long lines appeared in the bedroom. Except in the rare case when an Art Nouveau influence crept in, curves were few. Many period images show a stained wood picture rail at roughly the height of window tops, creating a strong horizontal accent. Occasionally the frieze section above the rail was painted in a complementary color, or stenciled or papered. (Wallpaper, applied from baseboard to ceiling, was seen more commonly after 1920.) Ceilings were invariably light and plain. 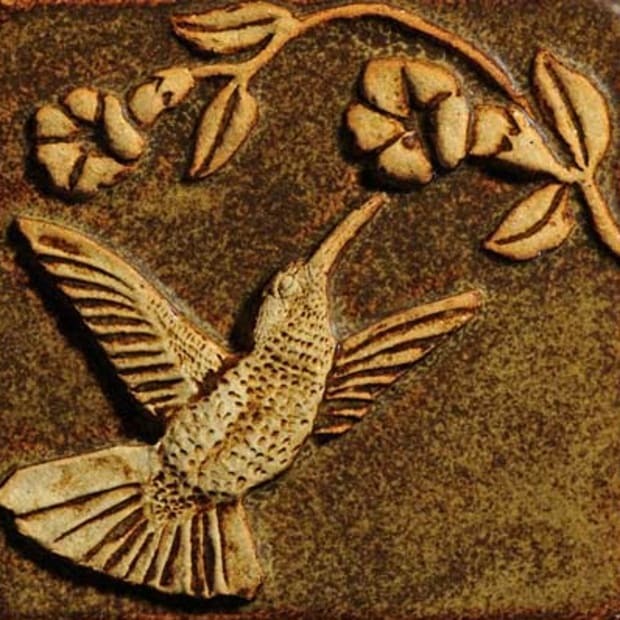 Those looking for more ornamentation or femininity while staying within the “art movements” might consider touches of Art Nouveau. Sinuous lines showed up in headboard design, frieze decoration, and carpets. 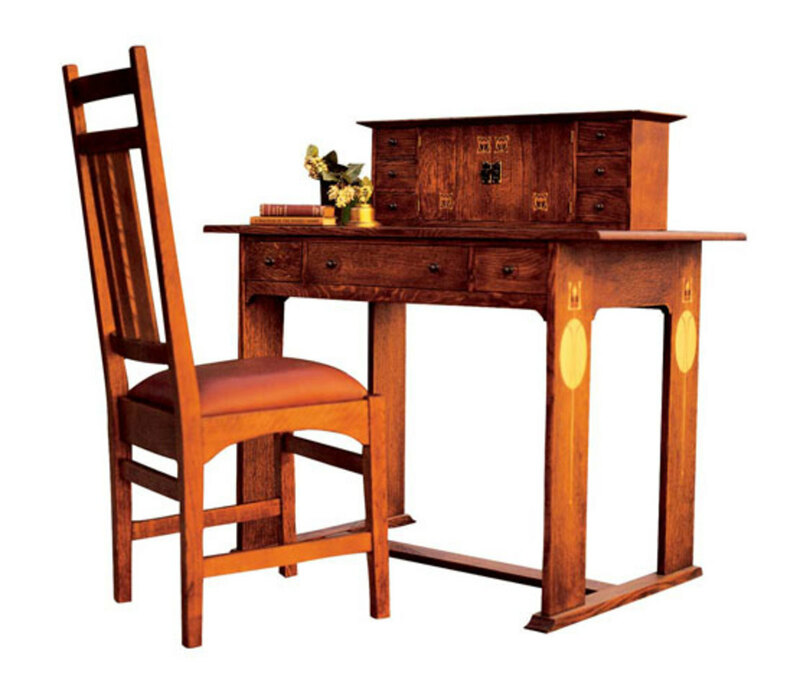 Very different, but still in the Arts & Crafts tradition, is the English Arts & Crafts style. You may be working with a strong English element in, say, an Arts & Crafts-influenced house with late Queen Anne, Shingle Style, or Tudor elements. And many houses of this period were transitional. 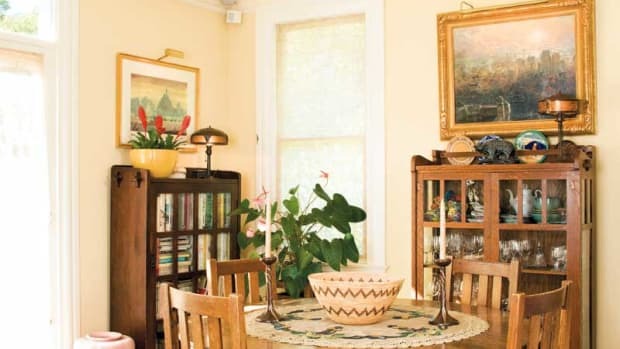 Their living and dining rooms may have Arts & Crafts elements, while the bedrooms would be better given a more traditional treatment, in keeping with the Colonial Revival style.